The two most vital factors for every motorcycle rider’s safety are being seen by other drivers plus clear illumination of the road ahead. Both require an outstanding headlight using advanced LED technology to replace dimmer, less reliable stock HID, halogen or incandescent headlights. The result is a much brighter, wider and more penetrating beam for daytime and nighttime riding. Our guide for finding the best LED headlight for motorcycle enthusiasts is based on extensive research across manufacturers’ products. 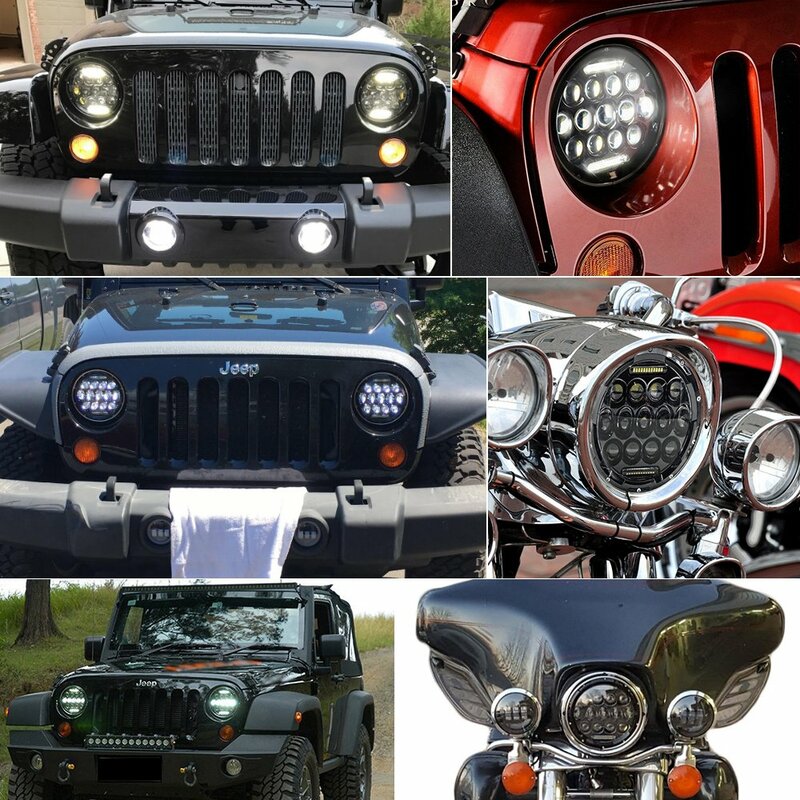 We have sorted out the headlight styles, technical details, and compatibility factors. The result includes the brightest headlight for Harley Davidson owners, seven-inch motorcycle headlights and our top choice, the Wisamic 5.75″ LED headlight. Read all the reviews and our selection guidance to narrow your choices and find the LED motorcycle headlight right for you and your bike. You then will be well-equipped to make your final choice. 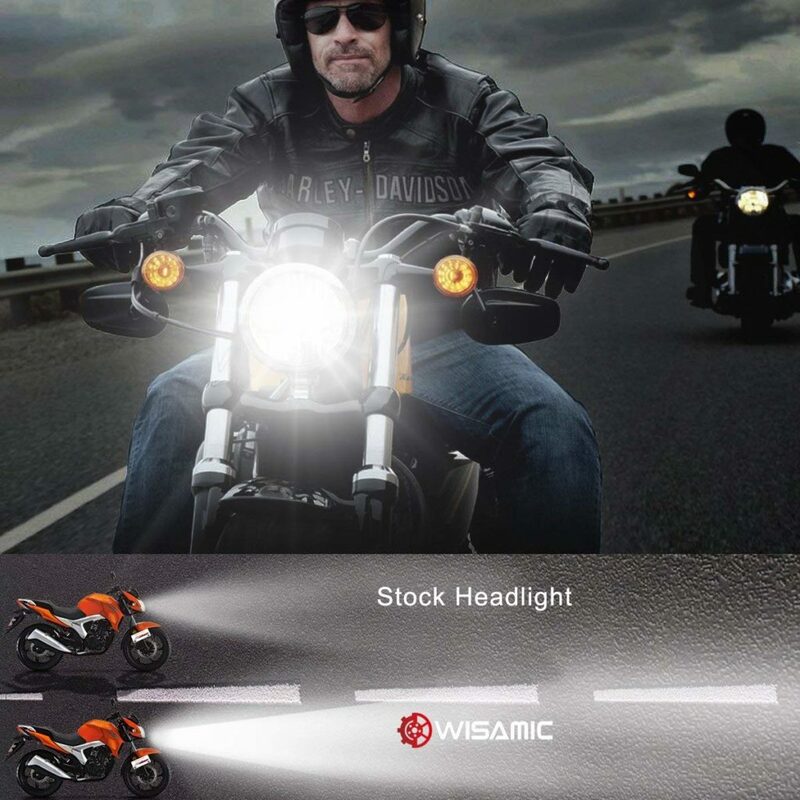 See and be seen with the Wisamic 5.75-inch replacement motorcycle best and brightest headlights with four times the illumination of stock motorcycle lights. Powerful, high-intensity Osram LEDs combine with projection lenses to produce a clean, bright 4000 raw lumens on high beam with excellent foreground fill and long reach for improved visibility and safety. Wisamic offers fast shipping, 60-day returns, and a generous two-year warranty. As one buyer put it, this headlight performs just as well as Harley Davidson’s upgrade LED headlight but at about 1/7th the price. So, why not buy a spare? Enjoy a far brighter, better focused beam with nearly double the reach, which improves your bike’s visibility and gives you increased reaction time. 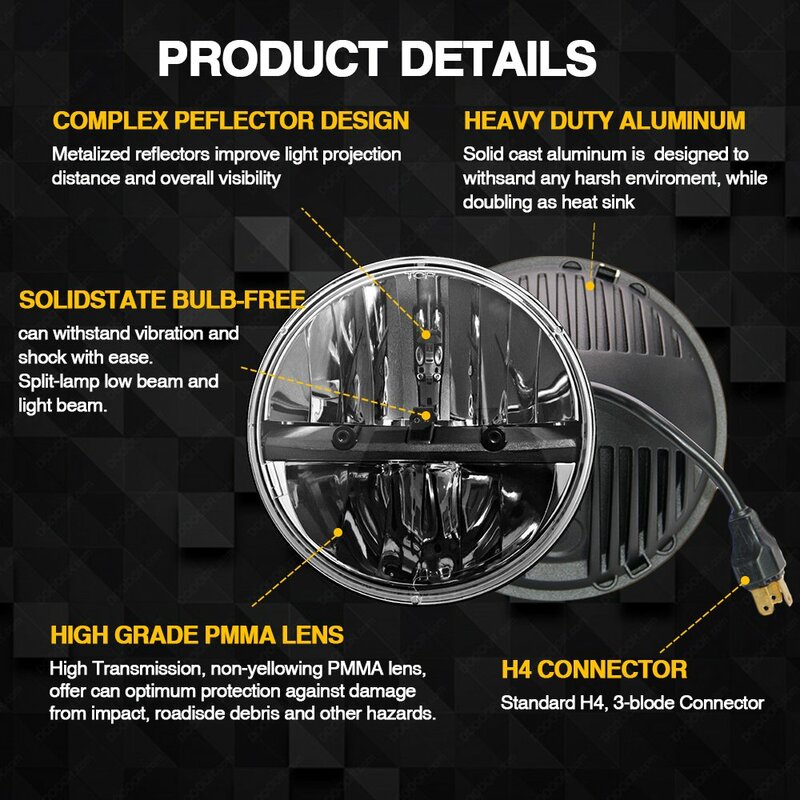 With a four-projector lens design with integrated low/high beams and ultra-bright, high-intensity LEDs, this is the brightest motorcycle headlight you can buy for an incredible range of Harleys, Yamaha and even Indian touring bikes. 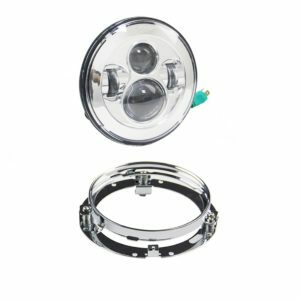 It features a 7 inch motorcycle headlight with 4000 raw lumens on high beam and 2600lm on low beam with 6000K bright, clear, pure white light. The beam pattern eliminates dark spots with a sharp low beam cutoff to avoid blinding oncoming drivers. 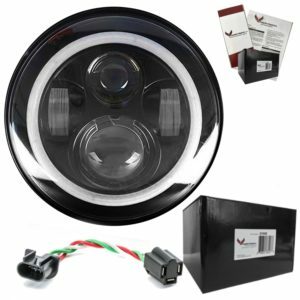 Both the headlight and the 4.5-inch passing lights feature well-sealed, shatterproof polycarbonate lenses and aluminum housings with integrated cooling. A supplied chrome headlight ring and a large set of connectors and wires ease installation. Compared to dealer-supplied HD Daymaker LED headlight kits, these headlights for Harley Davidson motorcycles are hundreds of dollars less expensive. The list of models this kit fits is extensive and includes many non-Harley bikes with 7-inch headlights. Kuryakyn has a well-deserved reputation for supplying the best LED lights for motorcycles around the world and these Phase 7 High-Intensity LED headlamp replacements are no exception. 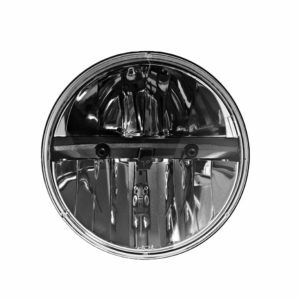 Unlike projector motorcycle headlamps, these are designed with a complex, metalized reflector design that provides a stock headlight appearance. It is sealed behind a hard polycarbonate lens, features a rib-cooled aluminum housing and an H4 plug. 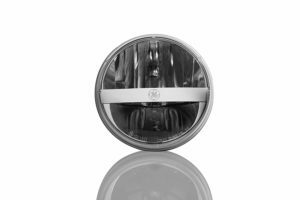 If the projector or multi-row LED look of many motorcycles headlights is not for you, these Kuryakyn H4 headlight drop-in provide the appearance you want with the high performance of super-bright, long-lasting LEDs. Add the passing lights kit for even greater visibility and style. Our motorcycle LED headlight review of the GE Lighting 69821 Nighthawk headlamp revealed a unique set of features. For one thing, if the white-bluish light of most motorcycle headlights turns you off, you will enjoy this light’s natural daylight color temperature of 5600K. This light’s durability is also superior to many others. It is not only designed for motorcycles but heavy work equipment as well, so it features epoxy-sealed electronics for extra resistance to moisture, dust, and vibration. 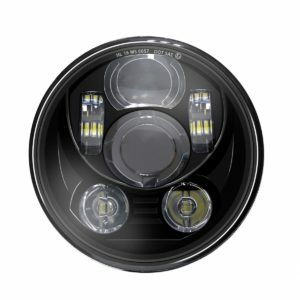 It features an eye-catching, split-lamp appearance with low beam on top and high beam on the bottom. Compared to GE’s compatible standard halogen headlamps, these offer 15,000 hour life versus 320 hours and 39 percent higher brightness. There is also a rectangular model available. This is perhaps the best LED headlight for your bike from a trusted company. If it matches the model number of your bike’s current light, it is a drop-in replacement. Enjoy superior performance and a natural color beam that most LED motorcycle headlights cannot match. For Harleys and just about any bike with a stock 7-inch headlight, this Eagle Lights quality replacement motorcycle headlamp with halo ring offers high-output, long-lasting LEDs that provide several times the illumination of HID, halogen or incandescent lamps. If your ride’s light has an H4 receptacle, it probably fits. An H4 to H13 pigtail is available separately. 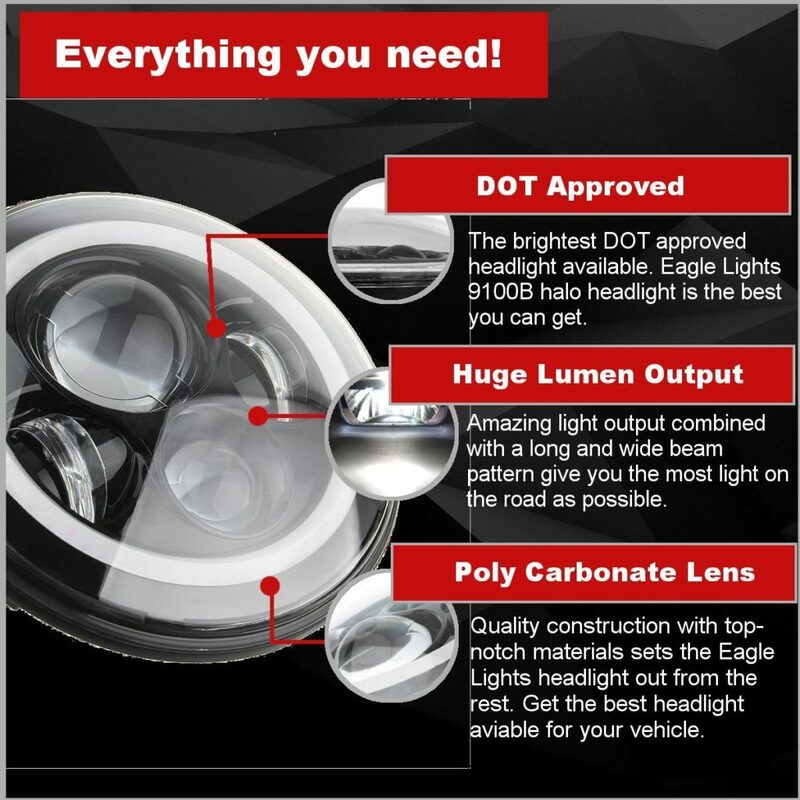 The best H4 LED headlight for motorcycle safety features a tough polycarbonate lens, heat-treated, die-cast aluminum body and over 1770 lumens of road illumination. Low beams have excellent foreground fill with high beams stretching to the horizon. Best of all, there is no wiring for the halo ring, which is on automatically on low beams to increase your bike’s visibility. With high output, low electrical draw, rock solid design and plenty of bright white light to lead the way on the darkest nights, what is not to like about the Eagle Lights 9100 LED halo motorcycle headlight? Note that it comes with either a black or chrome bezel. 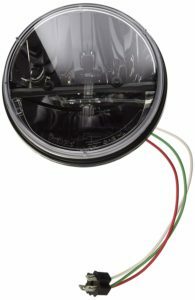 Unlike Harley Davidson LED headlight replacements with four projectors, the Uni-Light Round LED Headlight boasts 13 powerful LEDs in three rows plus DRL bars. The distinctive appearance also provides redundancy should an LED fail. Three modes are available: wide and flat low beam, full and piercing high beam and DRLs for daytime safety. These are powerful 7-inch motorcycle headlights with a night-ripping 6750 raw lumens on high beam and respectable 2250lm on low beams. They stand up to any road or weather conditions with an IP68 rating, a rugged polycarbonate lens and a durable aluminum housing with integrated cooling. The high-intensity Cree LEDS have a 50000-hour lifespan. Uni-Light backs these with a 3-year full replacement guarantee. 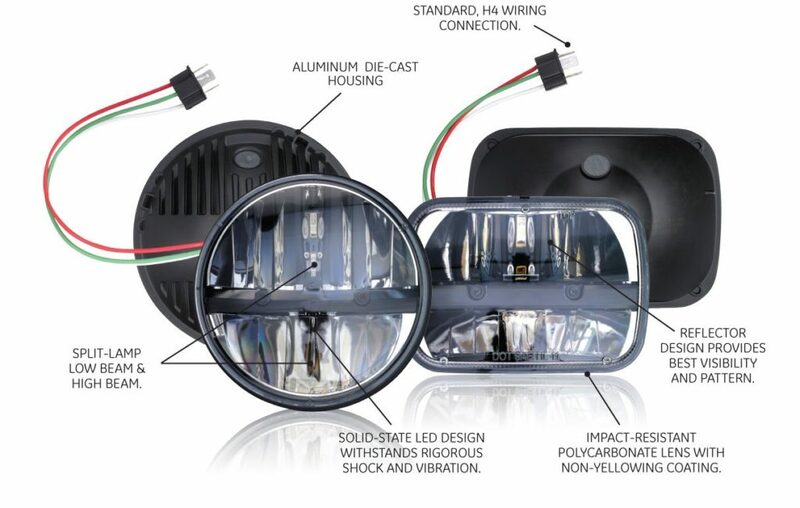 Many buyers of the Uni-light Harley LED headlights prefer the redundant lamp design and the high power of these lamps over the typical four-LED projector design. They do look cool and perform even better with one of the highest outputs and best waterproof ratings. The “Uni” in Uni-Light must stand for unique as this second Uni-Light proves with a different-than-most design featuring split beams in a metallized reflector housing. The upper half supplies low beam with both halves used for high beam. Also unique is their bulb-free solid-state LED light source. These features and the plug-and-play design for motorcycles with H4 or H13 receptacles plus exceptional brightness win them best LED headlight for motorcycle accolades. The 50,000-hour Cree MKD LEDs output 3600lm on high beam and 1800lm on low beam using 30W and 15W, respectively. Everything is included for quick installation using factory wiring in your bike. As always, Uni-Light backs these lights with an industry-leading three-year full replacement warranty. The best Harley LED headlight might be the one that does not look like it has LEDs. This Uni-Light has that old fashioned headlight look but outperforms competitors in ruggedness and providing a useful, void-filling beam to brighten your way. For improved road and bike visibility on a budget, check out the SKTYANTS four-projector Harley Davidson LED headlight. At under $50, it outperforms many drop-in motorcycle headlamp replacements at twice the price. 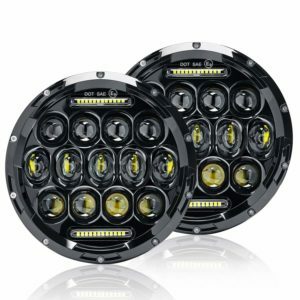 This versatile headlight is based around four 10W, high-intensity, 30000-hour lifetime Cree LEDs. A longer, brighter, blue-white beam is produced about three times as illuminating as Harley stock headlights. Housed in a tough die-cast aluminum housing with deeply ribbed cooling fins and a shatterproof polycarbonate lens, it is rated IP67 against moisture and dust intrusion. Note that there is a Eagle Lights harness 69200897 too. These cool motorcycle headlights for your Harley are a steal at under $50. They are compatible with a long list of Harley touring bikes that take 7-inch lamps and use an H4 socket. This headlight offers a low-cost path to significantly brighter roadways than HID or halogen can offer. As our reviews reveal, there are several makes and styles of cool, high-performance Harley motorcycle headlights available. Start the selection process by first setting an upper price limit you are comfortable with. Higher price does not necessarily mean you will get the light that is right for you. Except for our top-rated choice, the Wisamic 5.75-inch replacement motorcycle headlight, all the reviewed lights use Cree LEDs, but Osram and Cree are both industry-leading brands known for long life and top performance, so do not sweat that detail. Naturally, you have to check each light’s compatibility list to see if your bike is on it. Buyer comments can also reveal additional bikes the light will fit with perhaps minor modifications. Four or five LED main beams where each powerful LED has its own custom projector lens. Several of these also sport halo rings with a DRL function. LED motorcycle headlights that use multiple rows of lower power LEDs, which produce an optimized beam pattern. These offer higher redundancy in the case of a lamp outage. If they have DRLs, they are less conspicuous than halo rings. Split beam designs give you just two LEDs, but are very rugged and display an old school appearance. Finally, there is the Kuryakn Phase 7 High-Intensity 7-inch LED headlamp replacement with a smoky glass look unlike any of the other lights reviewed. Our final advice for finding the best led headlight for motorcycle riding is to peruse the buyer reviews for insights for how the lights install, any special fitting modifications and especially for wiring tips. If you are lucky, buyers might include photos demonstrating the beam patterns after installation. 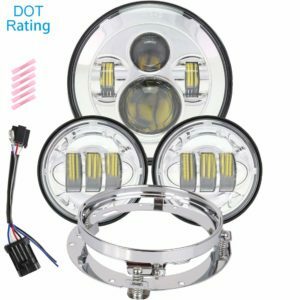 The main factors to think about when buying an LED headlight for your Harley Davidson or another brand bike, besides whether it is supposed to fit your year and model of bike, have mainly to do with technical details, installation tips and your local environmental conditions throughout the year. These factors assume that you have already reduced the list of selections following the tips given above. Most modern motorcycles use H4 connectors, but yours might use H13 or something else. So, make sure the light comes with the correct connector or adapter or that the seller has an adapter you can buy separately. Otherwise, plan ahead by obtaining wire, crimp connectors and tools to make a custom install. 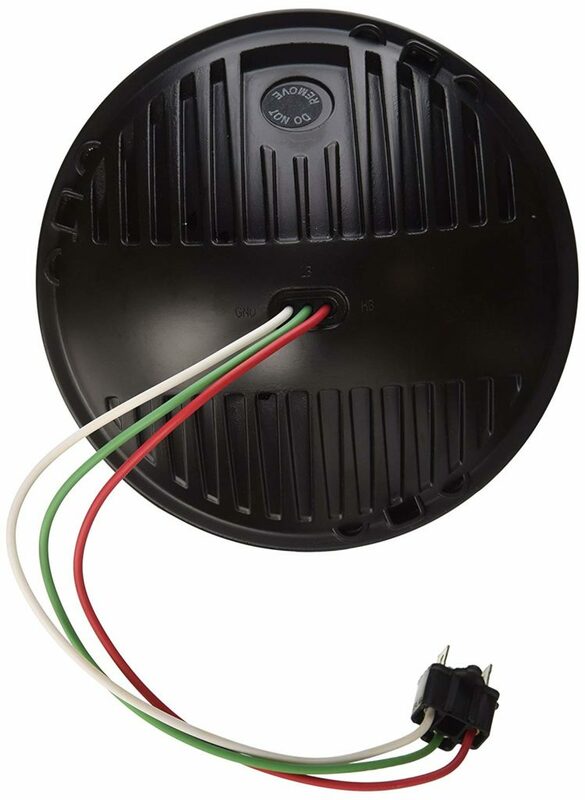 If you are installing passing lights too and they are not 100 percent plug-and-play, you may want to enlist the help of an automotive technician. Even though those 4-projector LED headlights look impressive, consider again if you might be more comfortable with a redundant multi-row design. After all, if you lose the one LED with the biggest projector, there goes your high beam, whereas 13-LED models will hardly dim if they lose one or two LEDs on a dark night. Installation is usually fairly easy on motorcycles as there is a lot of elbow room unlike on the front end of cars. However, you still must properly aim the headlight after you have secured it and that can get tricky. It depends on the kinds of adjustments available and on the type of beam pattern a particular light makes, which could be quite different than what the OEM light produced. Also think carefully in terms of your motorcycle riding habits and your area’s typical weather and road conditions. If you frequently experience dark road conditions, especially accompanied by rain, total light output becomes a critical factor. If conditions are often foggy, consider a passing/fog light kit, even if your bike does not already have one, for extra safety and visibility to other drivers. 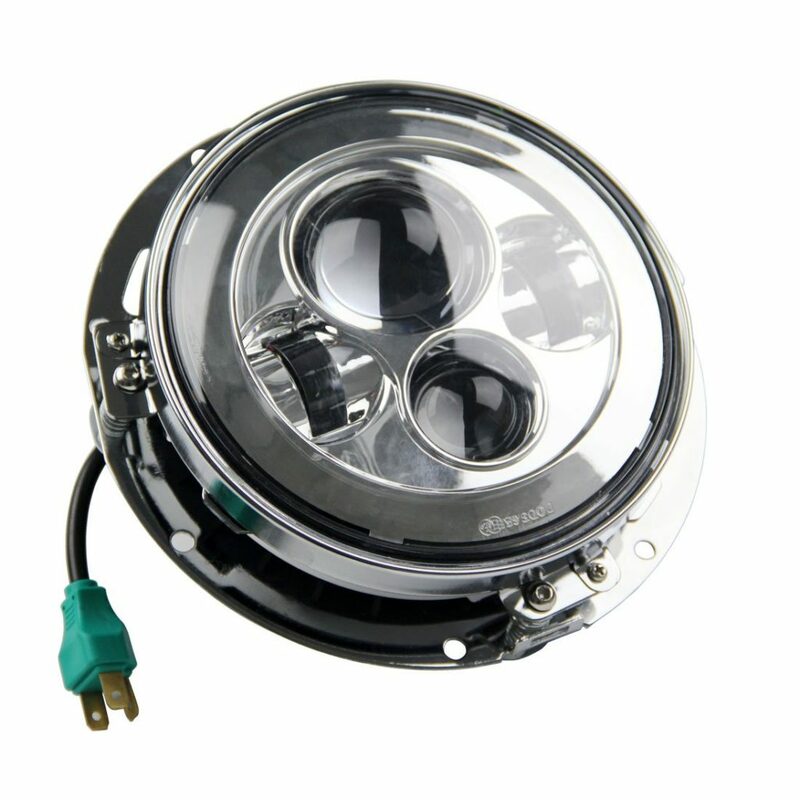 Light flicker is a very uncommon problem with quality LED motorcycle headlights as most already have a ballast and CAN bus compatibility built in. It is something to look out for in the buyer comments for your choice of headlight however. If you experience flicker, first look for loose connections, second contact the manufacturer to see if they have an alternate adapter and lastly get a replacement or return the light for a refund. How can I get LED headlights for my bike? There are a couple of ways to convert to LEDs. One is to buy an LED bulb conversion kit for your halogen light or – what we recommend – is buying an entire replacement kit. The latter provides you better beam patterns and increased brightness. Will an LED headlight kit really be brighter? Absolutely it will be brighter than your stock HID or halogen light. Even if you choose one of the lower output kits reviewed here, e.g., under 3000lm, you will at the least double or triple your headlight brightness. 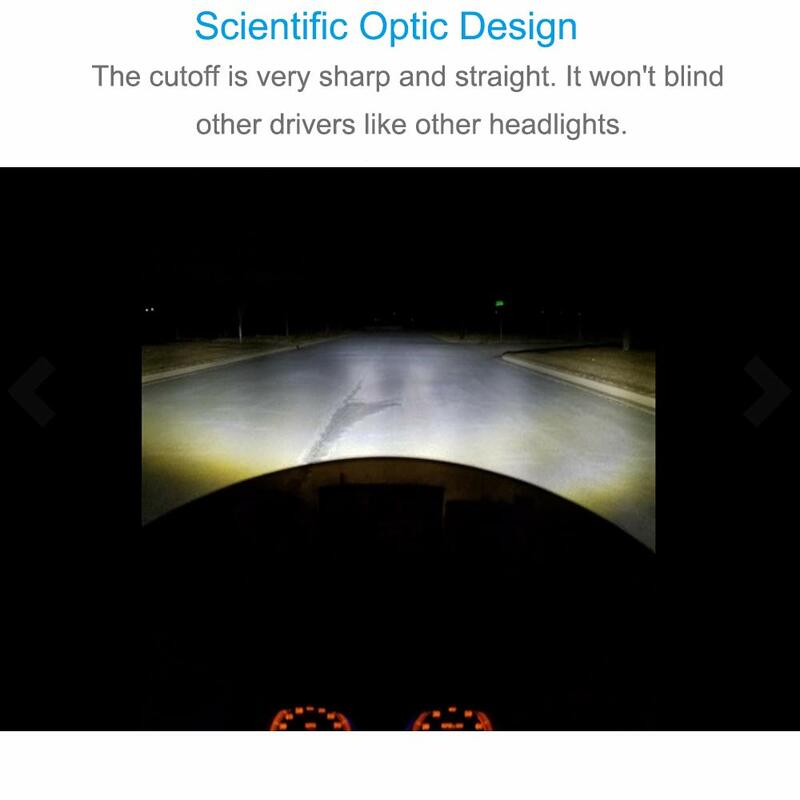 Won’t I blind oncoming drivers with a brighter light? 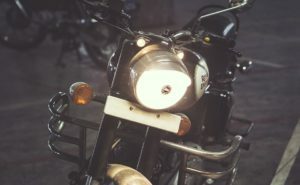 Motorcycle LED headlights are brighter, but they use projection lenses and well-designed reflectors to control the beam width and cutoff to avoid blinding oncoming traffic. Naturally, much depends on how well the headlight is aimed. Isn’t measuring output in raw lumens misleading? The answers are no and yes. Raw lumen output is theoretical output that is higher than actual output. However, since manufacturers use raw lumen output as a universal yardstick, it provides a valid relative measure of brightness when comparing different headlights. By this point, you should feel ready to make a decision on the best LED motorcycle headlight for you and your bike. You have a wealth of choices and the knowledge you need to find the right fit, the right look and features plus the right performance specs. Once you switch from conventional motorcycle headlights to LED headlights, there is no turning back. 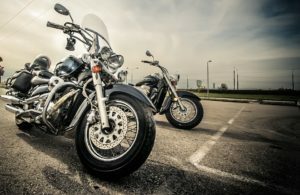 The clear advantages of longevity, lower power consumption and superior brightness are going to make your motorcycle rides more enjoyable and safer. We are certain you will enjoy buying on Amazon due to their superb customer service, great prices and their generous return policies, all of which make it a breeze to complete your purchase. Buy your chosen LED headlight now to start enjoying the power of LED headlights to make your rides safer and satisfying.